1) Whisk egg yolk and sugar in (A) till sugar dissolved. Add (B) and mix well. 2) Sift in (C) and mix till a smooth and uniform batter is formed. Set aside. 3) Whisk egg white till frothy, Add 1/3 of sugar and cream of tartar in (D). Continue to beat and add remaining sugar in 2 sessions and beat till stiff peak (original recipe is to beat whites till soft peak then add sugar/cream of tartar at one go). 4) Fold in 1/3 of the meringue to egg yolk mixture, fold till just incorporated. Repeat the same for the remaining meringue. 5) Pour batter into 20cm tube pan, bang it on tabletop twice to release air bubbles. 6) Bake in preheated oven at 175C for about 40 mins (when in doubt, bake for a few more mins. 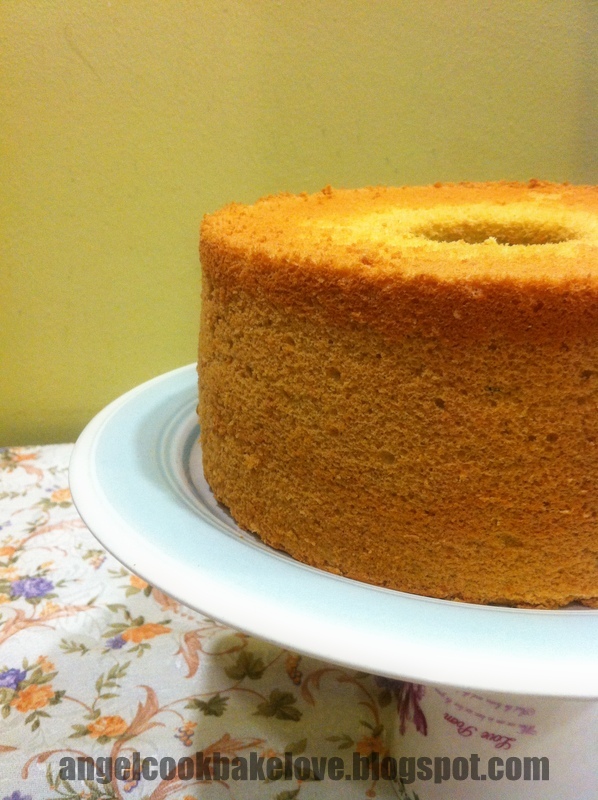 For chiffon cake, it's better to over baked than under baked). Invert the cake immediately once taken out from the oven. Cool completely before removing from mould. 1) Use egg of net weight 60g each (without shell). 2) Cream of tartar can be replaced by 1/2 tsp of lemon juice or vinegar. 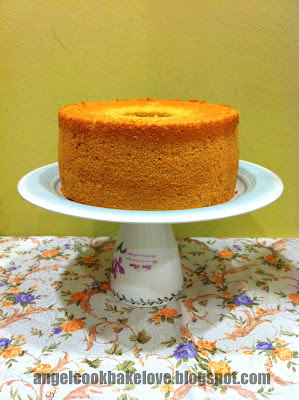 This is how I cool my chiffon cake. Cake must be far from the tabletop to prevent water condensation on cake surface. 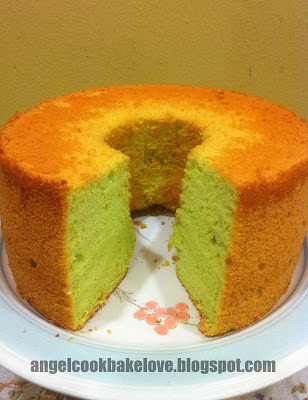 yummy i love pandan cake.. Indeed it is very tall !! Pandan chiffon is always good and will never go out of trend ! I look so tall and nicely done. Can a replace pandan juice with pandan paste? How much I need to use? wow, your chiffon look really tall !! I have yet to try 空手脱模, i scare my cake will broken, hehehe..
Me too!!! Pandan pandan I love you! Don't worry. Your cake won't be broken. Try it. I am sure you will fall in love with this method. Hi, love the height of your chiffon cake... what is the material of the cake pan, the brand and size and where can we get it? Thanks. I think the material is aluminum. Size is 20cm or 8 inch . 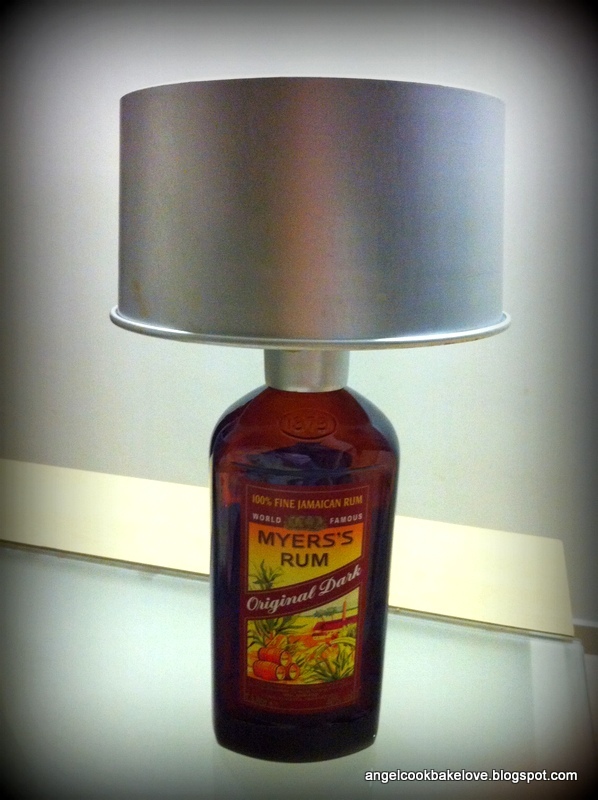 U can buy from baking supply shop or some household store.